Knuckles the Echidna is a 32-issue series of American comic books published by Archie Comics that ran from 1997 to 1999, featuring Knuckles the Echidna, one of Sega's mascot video game characters from the Sonic the Hedgehog series. The series was a spin-off of Sonic the Hedgehog and shared continuity with that title. The series continued the ongoing story of Knuckles's search for answers about his heritage and true nature, which had previously been featured in the Sonic the Hedgehog series as well as several specials and miniseries. 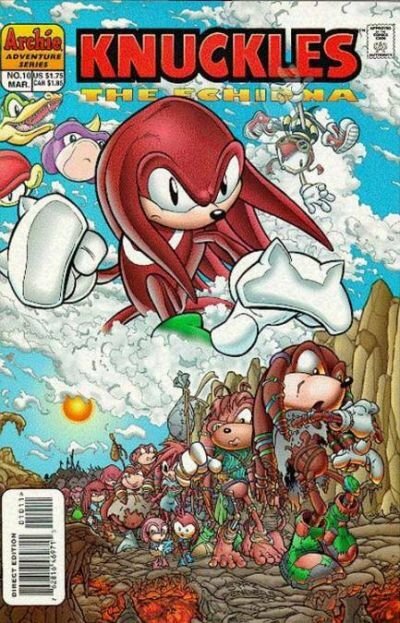 After the series' cancellation in 2000, Knuckles's stories were continued as a regular feature in issues of Sonic the Hegehog until 2003. After this, Knuckles and several of his supporting cast members became a semi-regular feature of Sonic's stories, ultimately crossing over both storylines in an unusual manner.